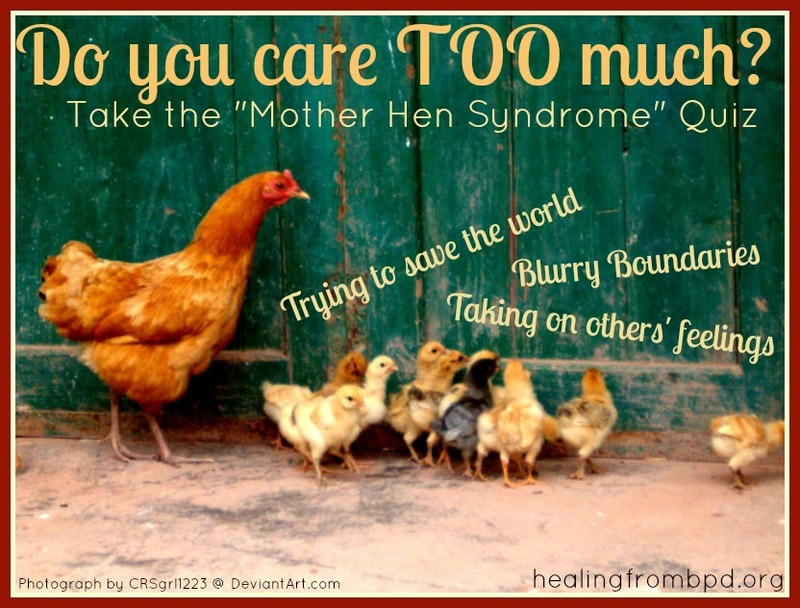 Do you have “Mother Hen Syndrome*”? I sure do. 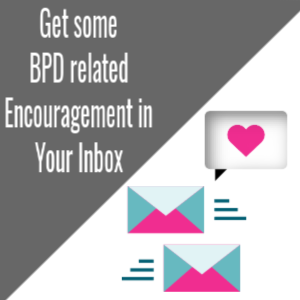 As someone with Borderline Personality Disorder, a combination of issues around my sense of identity and my sometimes blurry experience of boundaries in relationships cause me to take on more than my responsibility when it comes to others.Let’s see if you can relate. A. just listen, be present, and allow the person to vent. B. become so immersed that I literally feel what they feel and become consumed with emotion. C. be compassionate, but not take it on as my own. D. shy away from helping. A. encourage her to look into more affordable plans. B. help her look into more affordable plans. C. immediately offer to cover her phone bill each month. A. politely tell them you don’t feel well and decline. B. feel their needs are higher than yours and head right over. C. tell them they have a lot of nerve calling you on Sunday. D. just let the machine take the call. A. say yes — he probably needs it more than me if he’s asking. B. gently tell him you’re going to have to go on break because you’re very hungry.C. pretend you don’t hear him and hope he goes away.D. tell him that you’re in no mental state to answer him. C. stick around in the room pretending you have a question. D. hide in the bathroom. End Mother Hen Syndrome Quiz. Mother Hen responses: 1-B, 2-C, 3-B, 4-A, 5-BHow many did you get? Are you a Mother Hen? I had a therapy appointment and was very anxious about the topic, which was past trauma. I worried that I wouldn’t be able to speak about it or that I wouldn’t be able to handle the discussion. In IOP there is a younger woman who is going through a lot of emotional turmoil. She just found out her diagnosis and is on medication for the first time. At the same time, she continues to drink alcohol and had stopped taking one of her medications. Mother Hen Red Flag: After our group, when she told me she had to have one of her medications filled, I walked with her to the pharmacy to make sure she followed through. You may see this as supportive, but we were advised by one of the doctors in IOP that it’s best to not socialize after group with other members until after each person has graduated. My need to protect her superseded the desire to follow that rule. When we got to the counter, the pharmacist said they were all out of the medication and that they could call around to find a pharmacy that had it in stock. When they found one, they just said the city it was in. I asked her, in front of the clerk, “Now, do you know where that is? Do you need an address? Directions?” I also asked her to text me that she was sober later in the evening. Inappropriate much? I am a caring person, but my challenge with appropriate boundaries is causing me to take on more than my fair share — and I’m the one who needs to learn how to rein it in. Lately, when others are experiencing their emotions, I notice that something that used to happen before is happening again. Mother Hen Red Flag: I become so engrossed in their experience – so entwined in their emotions that I lose track of where they end and I begin and vice-versa. If someone gets sad, instead of just noticing their sadness, letting them have their experience, and being supportive and present, I become so emotional for them. I want to fix all of their problems, comfort them, and love them. It’s not that I think I actually have the answers and can solve their problems. It’s more that I want to reassure them, offer them some hopeful perspective, and help them in any way I can. I am currently reading a book, aptly named: Boundaries: Where You End And I Begin, and I am beginning to have some insights as to why this is. I’ll keep you posted. I’ve also selected this book for an upcoming BPD Book Club that I’ll be hosting, so be sure to pick up a copy and start reading if you’d like to participate. In the meantime, one of my goals and focuses in IOP is to keep watching the boundaries issue and work on it with the support of my clinical team. It’s complex! Practicing Interpersonal Effectiveness and Emotion Regulation DBT skills are two of the methods that I am using to work on this and cope. Can you relate to being a mother hen? In what ways? 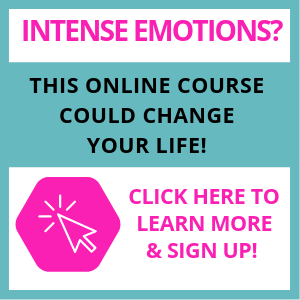 Can you think of any skills that can help you with assertiveness, self-care, and boundaries in the moments that you are tempted to take care of others beyond your reasonable responsibility or desire? * I’m sure you know this, but just for clarity’s sake, “Mother Hen Syndrome” is not a real condition. I’m not a therapist. 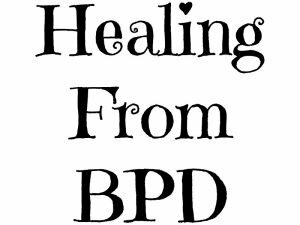 This post is about my experience with identity and boundary issues due to BPD. If you can relate, please check with a qualified, licensed therapist to discuss your concerns and get the help and support you need. When will you be starting the book club? I have all the above! That is one of the dilemmas for sure, Stephanie. Thank you for sharing.